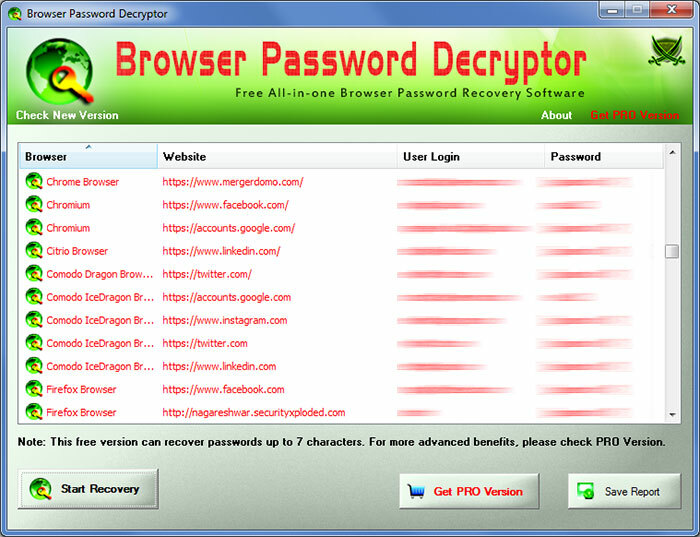 Browser Password Decryptor is the FREE software to instantly recover website login passwords stored by popular web browsers. It supports recovery of website Login passwords from these browsers * Firefox * Internet Explorer * Google Chrome * Google Chrome Canary/SXS * CoolNovo Browser * Opera Browser * Apple Safari * Comodo Dragon Browser * Flock Browser * SeaMonkey Browser Here are the main features * Instantly decrypt and recover stored encrypted passwords from popular web browsers. * Recover password of any length and complexity. * Save the recovered password list to HTML/XML/Text/CSV file. * Very easy to use with cool new GUI interface. * Support for local Installation and uninstallation of the software. Browser Password Decryptor works on most of the Windows platforms starting from Windows XP to latest operating system, Windows 8. This site does not contain serial number, crack, keygen Browser Password Decryptor serial number : serial number is the simplest type of crack. A serial number(cdkey,product key,etc) is register the program as you may already know. a crack or keygen may contain harmful software. If you cannot find the exact version you want, just give it a try. for more information read .nfo/.txt/.diz file include in zipped file.